A charity which looks after a memorial to 167 men killed in the Piper Alpha disaster has been given £185,000. 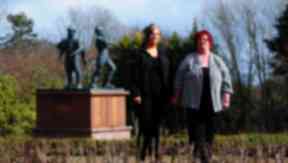 Pound for Piper was founded with the aim of repairing the dilapidated statue in Aberdeen's Hazlehead Park in time for the 25th anniversary of the tragedy in 2013. The memorial is engraved with the names of the victims and contains the ashes of men who were never identified in the aftermath of the accident. Oil and Gas UK, which raised £140,000 for the statue's repair, has given a further £185,000 to help secure its long-term future. Chief executive Deirdre Michie said: "We were delighted funds raised by our members for the Pound for Piper Memorial Trust contributed towards the initial restoration of the North Sea Memorial Rose Garden, which included planting and pruning, cleaning the monument and painting the surrounding benches. "Now we are handing over just over £185,000 to the trust which we hope helps ensure this tranquil and beautiful spot continues to flourish for many years to come." A total of 167 men were killed aboard Piper Alpha when a missing safety valve caused a gas leak which ignited and exploded through a steel firewall on July 6, 1988. A flying piece of metal ruptured a pipe, causing another fire. Dozens were killed leaping from the platform into the freezing North Sea in an attempt to escape the ferocious blaze. Others died waiting for rescue in Piper Alpha's accommodation block, where they had been told to gather. Just 61 men survived. Carol Banks, from the Pound for Piper Memorial Trust, said: "The North Sea Memorial Rose Garden is a place of reflection and remembrance for the families and friends of those who lost their lives in the world's worst offshore oil and gas disaster and we welcome this latest industry support." Lucy Norval, also from Pound for Piper, added: "The money will help the Pound for Piper Trust and ground staff at Hazlehead Park keep the garden looking its best for years to come."